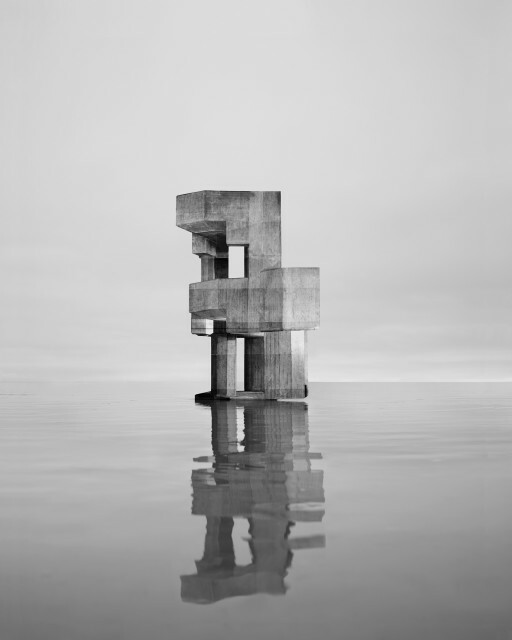 Noémie Goudal, Observatoire VIII, 2013, lambda print on Baryta paper, 59 x 47"
At first sight, Noémie Goudal’s photographs appear to depict ambiguous, hard-to-situate spaces that, though placid, are thoroughly uncanny. The French-born artist, who works between Paris and London, presents her first solo exhibition here, titled “Cinquième Corps” (Fifth Element). In the series “In Search of the First Line,” 2014, Goudal documents a group of majestic, cathedral-like arches mysteriously set into concrete industrial buildings. In “Observatoires” (Observatories), 2014, lone staircases and pyramids float like ruins from a long-dead, postapocalyptic civilization. All of these strange and imposing architectural forms, however, are actually flimsy, two-dimensional props. Goudal prints out found images on a large scale (piecing them together on separate sheets of paper), arranges them like theatrical backdrops, then photographs them. The artist is a deft fabulist, and the artifice she manages to construct is slow in revealing itself. It is only through close and careful inspection that we are able to discern the imperfect folds and subtle bulges of her various simulacra. The hallucinatory qualities manifest in these series also pervade Goudal’s site-specific stereoscopic installation, Study on Perspective II, 2016. Two backlit images, hung at opposite ends of the room, yield a sharp 3-D landscape that pops when the viewer is positioned before an elongated upright mirror. Her analog approach to virtual reality—rich, haunted, beautiful—evokes credibility and incredulity all at once.